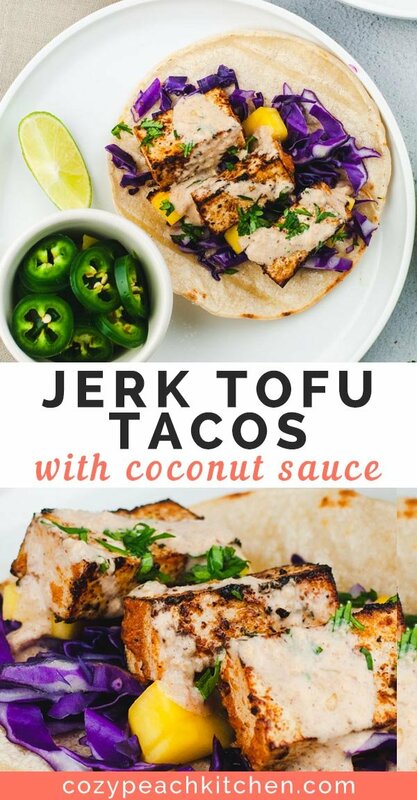 These flavorful jerk tofu tacos are marinated in jerk seasoning then sauteed until crispy and blackened. 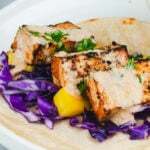 Make it a complete meal with corn tortillas, shredded purple cabbage, mango, and a coconut drizzle. Vegan, vegetarian, and gluten-free. 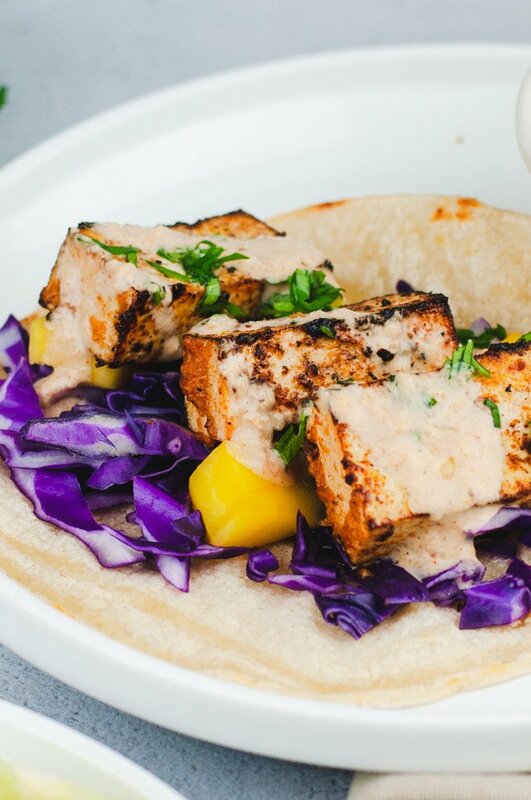 These Jamaican inspired jerk tofu tacos are so flavor packed! 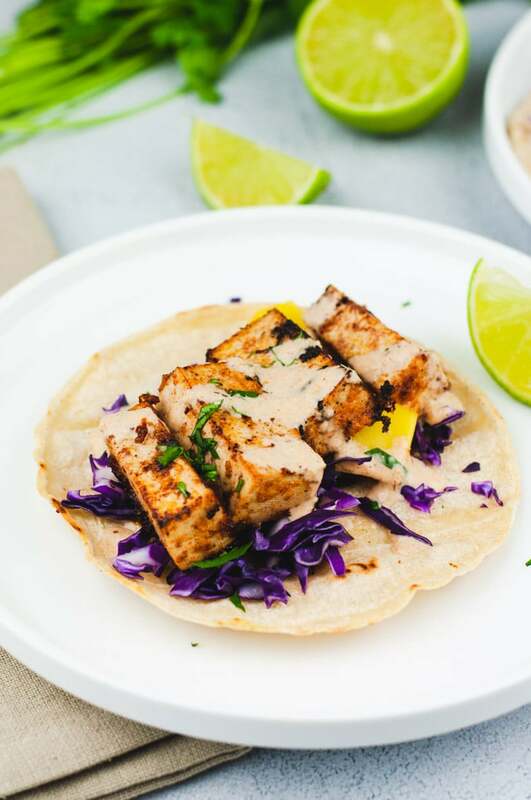 The tofu is marinated in jerk seasoning, then sauteed and served on corn tortillas with purple cabbage, fresh mango, and a drizzle of coconut sauce. 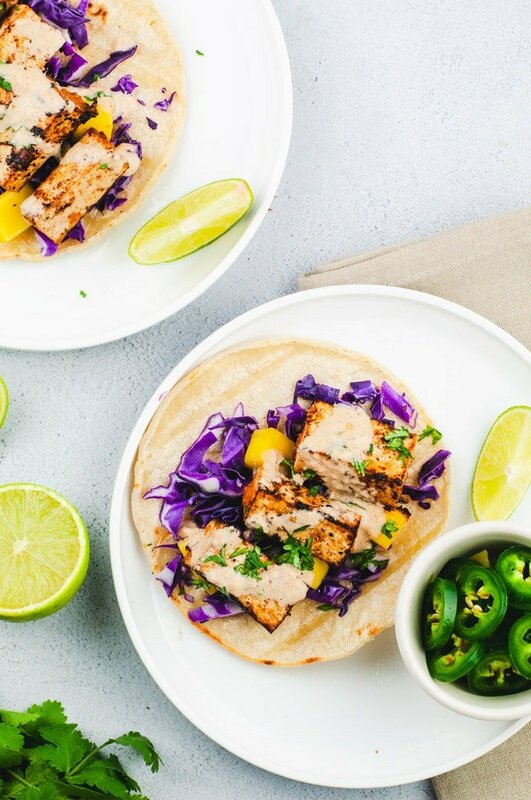 These tofu tacos meet both of those requirements. Sauteing the tofu over high heat creates a crispy blackened outer layer, and adding an entire jalapeno really kicks the spice up a notch. But don’t worry, the spice factor can easily be adjusted to fit your heat preference. I’m always looking for vegetarian recipes that turn a normal weeknight dinner into something special. Cooking with a new seasoning combination or flavor profile is a great way to do just that! I recently shared another taco approved recipe, these vegan tofu chorizo crumbles, so I figure its best to keep the tofu ball rolling. I’m ready to try out some new tofu flavor combinations. Are you with me? What spices are in jerk seasoning? The main spices in jerk seasoning are garlic powder, cayenne pepper, ground thyme, onion powder, parsley, paprika, allspice, black pepper, nutmeg and cinnamon. Sound like a lot of spices? That’s because jerk seasoning has a lot of flavor! You should be able to find Jamaican jerk seasoning (not jerk paste or sauce) in the spice or international aisle at your grocery store. Want to avoid a spicy jerk seasoning? Check the label for spice level, or you can easily make your own seasoning. Making this tofu is divided into two parts: marinating and sauteing. Press the tofu for at least 15 minutes to remove excess water. You can use a tofu press or place the tofu between two plates weighed down with a can or bag of dry beans. Marinate the tofu for at least 30 minutes in a flavorful combination of pureed jerk seasoning, olive oil, red onion, lime, ginger, brown sugar, garlic, soy sauce and apple cider vinegar. Saute the marinated tofu in a hot pan until dark brown, almost blackened. 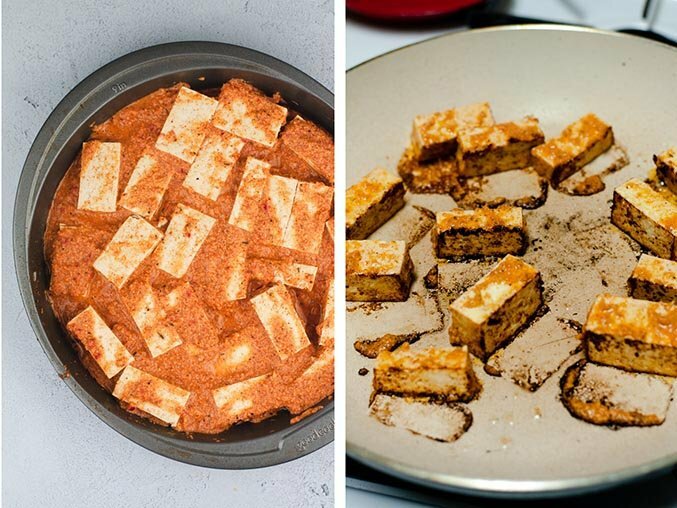 You don’t want the tofu to be burned, but it should be crispy and dark around the edges. Turn to saute each side evenly. Heat the tortillas in a hot, unoiled pan until lightly browned on each side. Combine the remaining jerk tofu marinade with equal parts coconut milk to make a flavor-packed sauce. 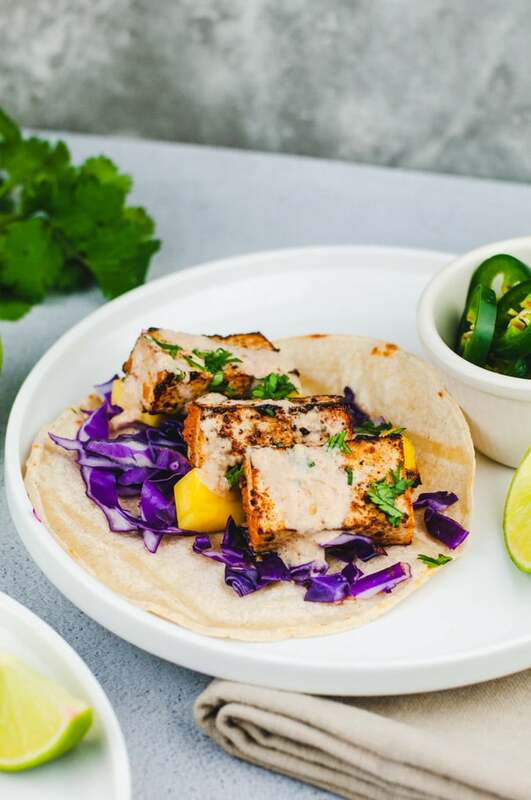 Layer the tacos with sliced purple cabbage, mango, and jerk tofu. Drizzle with coconut sauce. 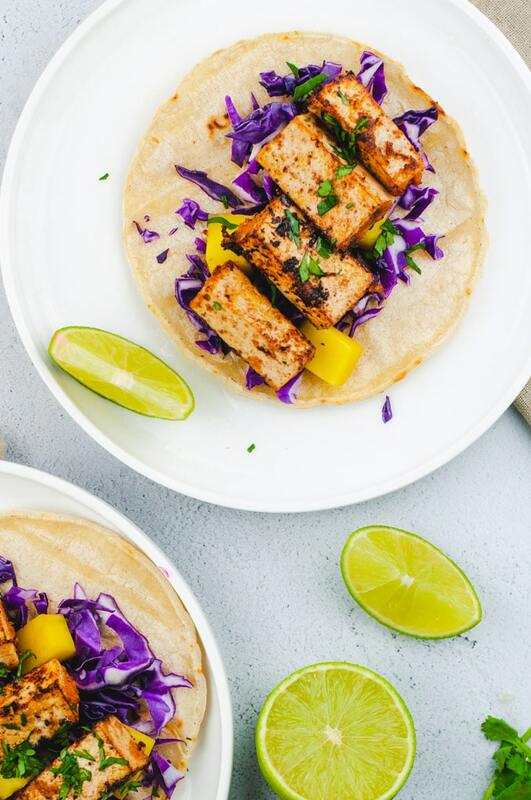 Crispy blackened jerk tofu is paired with shredded purple cabbage, diced mango, and a coconut drizzle for a flavorful weeknight meal. Press the tofu for at least 15 minutes. If you don't havea tofu press, place the tofu block between two plates. Weigh the top plate down with a heavy can or bag of beans until water starts to come out of the tofu block. Prepare the marinade by blending together the red onion, garlic, ginger, jalapeno, jerk seasoning, apple cider vinegar, soy sauce, olive oil, lime juice and brown sugar into a puree. Slice the tofu into thick rectangles and place in a shallow dish. Cover with the pureed marinade. Let marinate covered in the fridge for at least 30 minutes and up to 24 hours. Heat a skillet over medium-high heat. Add the tofu (reserve the marinade for the coconut sauce) and saute until dark brown, almost blackened. Rotate to saute each side. Make the coconut sauce by stirring together equal parts remaining marinade and coconut milk. Heat the corn tortillas in a hot skillet over high heat. Flip to brown both sides. 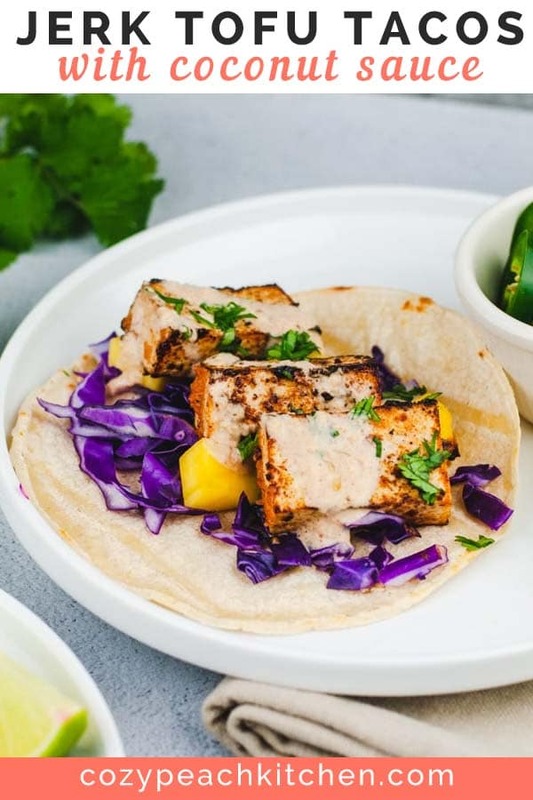 Make your tacos by layering each tortilla with purple cabbage and mango. Top with blackened jerk tofu and drizzle with coconut sauce. Enjoy! This recipe is adapted from Piquant Post's Jerk Chicken recipe.